The old familiar adage says "A family that prays together, stays together!" The Murrills are here as living examples and musical embodiments of that very fact. This six-member group of siblings knows the worth and the value of family prayer first hand. They also can attest that prayer is not only a language of love, but it can also be a dialogue of despair. After losing their mother following a lengthy illness, The Murrills instinctively banded together and did the only thing they knew to do... they prayed. 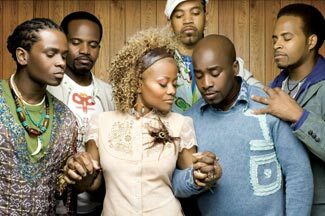 Brothers Darwin, Damion, Donnell, Andre, and Durwood and sister Arnetta have been praying and singing together since they were toddlers. As is the story of most of accomplished singers, The Murrills began singing in the church. They traveled locally as a prodigy group, at their father's behest, and won over each crowd before which they stood with their amazing talent that rivaled their chronological ages. Unlike many of their contemporaries, however, The Murrills never left the church, and became seasoned professionals at leading praise & worship services at their home church. The Murrills were introduced to their destiny when a gentleman named Donald Lawrence took the reigns of the local community choir, to which several of them belonged. He immediately spotted the keen talents of the individual family members and they became fast friends. Over the years, the friendship evolved into family, and Lawrence kept them involved and visible as he climbed the musical ladder and became one of the most renowned, celebrated, and sought-after artist/producers of our time. When Donald Lawrence formed his own label imprint, Quiet Water Entertainment, The Murrills were among the first acts he signed.